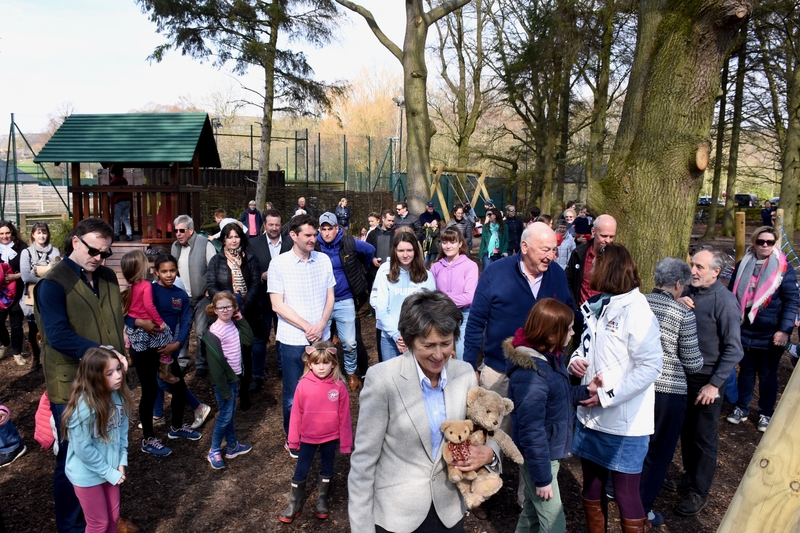 On Saturday 6 April, the Duchess of Devonshire, accompanied by the Duke of Devonshire, officially opened Baslow Woodland Park — a brand new adventure play park designed for children of all ages. The new woodland park — funded by Baslow and Bubnell Parish Council, with a generous contribution from the Duke and Duchess of Devonshire — has transformed what was an over overgrown and disused coppice that borders the Baslow Sports Field. Where there was once self-seeded saplings, fallen trees, weeds and brambles there is now a wide range of high quality wooden play equipment, including swings, balance beams, climbing frames, a zip wire and a fitness zone, with natural play bark covering the entire area — another generous contribution from Chatsworth. There are picnic tables and park benches, and there is also a nature area — separated from the main play park — that will be used by the local school to help teach the children about wildlife conservation. Baslow Woodland Park is the result of community activism that was led by the Parish Council who, in 2015, set up the Woodland Park Working Party, which included members of the public and parish councillors, with representatives from the Baslow Sports Field and local school, who worked together to bring the park to life. To help prepare the woodland for the new play equipment the working party organised a number of clearance days, which were well supported by the local community. The working party was also supported by Sheffield-based architects, HLM, whose landscaping division drew up plans for the park and helped with the planning application that was submitted to the Peak District National Park Authority. Commenting on the new park Christopher Brown, Chairman of the Parish Council, said: “Baslow was the only village in the area not to have any recreational facilities for younger children and so we are delighted to have delivered this exciting new park that can be enjoyed by adults and children, alike.